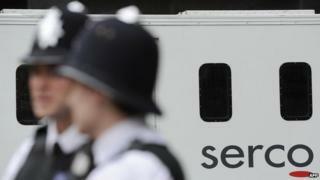 G4S and Serco should be barred from bidding for public sector contracts while they are investigated for fraud, campaigners have said. Prison charity the Howard League for Penal Reform said it had taken a dossier of accusations against the two outsourcing companies to police. The firms are subject to a Serious Fraud Office (SFO) probe into contracts for electronically tagging offenders. A suspension preventing them bidding for work was lifted earlier this year. They were barred last year after an audit found they had charged taxpayers for tagging criminals who were in jail or did not exist. Serco won a new government contract after the Cabinet Office ended its ban in February, while G4S has been allowed to bid again since April. But the Howard League criticised ministers for considering giving the multinationals new contracts. Chief executive Frances Crook said: "The delivery of justice is one of the most precious public services and we must, as a nation, adhere to the highest standards of probity." G4S has agreed to repay £109m to the public purse after an audit found it overcharged for providing electronic prisoner tags. Serco said it would pay back almost £70m. The SFO is examining allegations that the companies charged for tagging criminals who were dead, offenders who had gone back to jail and others who had fled the UK. "The dossier compiled by the Howard League is a litany of failure by private companies," Ms Crook added. The allegations will be sent to the Public Accounts Committee which investigated government outsourcing earlier this year. Has government become too aggressive with outsourcers?